Among Frost’s many claims, he notes that the law cannot pass until it is all fulfilled, and among some of the jots and tittles of the law are predictions of the passing of “heaven and earth.” Thus, Frost concludes, until the material universe passes away, not one jot or one tittle of the Law will pass away. Let’s be clear: Jesus did say “until heaven and earth passes, not one jot or one tittle shall pass from the law.” So that is beyond dispute. The question before us, however, is, did Jesus mean that the law of Moses (Torah) will not pass away until the physical heaven and earth are destroyed? Second, where in the Tanakh do we find a prediction, or predictions, of the passing of the physical heaven and earth, per Frost’s claim? I should observe that while Frost assures us that the OT predicts the end of the material heaven and earth, he did not give us any documentation. He offered not a verse to support that claim. He simply claimed: “We can also infer that the disappearance of the heavens and the earth is included in what the strokes of the pen of the Law and the Prophets say. That is, the Law and the Prophets contain within them the fact that the heavens and earth will disappear.” (P. 3 of 13). Don’t you think it would be somewhat important to prove this foundational part of his argument? It is insufficient to simply claim something to be true, especially something that is critical to your argument. I took note in the first installment that Frost made the claim that material heaven and earth is what Jesus had in mind in Matthew 5, yet, once again, he offered no proof for his claims. His presumptive approach is, to say the least, disturbing and revealing. 2. The Old Covenant predictions of the passing of “heaven and earth” are in fact predictions of the passing of the Old Covenant world of Israel– not predictions of the dissolution of material creation. Let’s look at the first point. Cold and heat, Winter and summer, And day and night Shall not cease.” (Genesis 8:21-22). Assuming– as Frost certainly affirms– that the Flood was universal, what do we find here? We find the Lord promising that He would never again destroy every living creature as He had done. Now the normal argument is that what He meant by, “As I have done” is that He would never again destroy the world by a flood, but, that He will destroy it by fire – as 2 Peter is taken to mean. Thus, God was not concerned with Mercy, or even Magnitude, but just with a different Method of destruction! (Evidently, in that way of thinking, a Flood is messier than Fire!). I will not take the time to discuss it here, but suffice it to say that God promised in Isaiah to destroy “heaven and earth” with a Flood! He even used the language of Genesis to describe it! Perhaps this will pique the reader’s curiosity. I discuss all of this in my book The Elements Shall Melt With Fervent Heat. S, if we consider that YHVH was making this promise based on Mercy, not Method or Magnitude, then we have here a promise that He would never again bring a world wide judgment on the earth. By the way, as to the question of Magnitude. The traditional view of the passing of heaven and earth– the view now of Frost – the supposed end of time, catastrophic conflagration would be (will be) absolutely incredibly greater than the Flood! After all, the heavens– the planets, the sun, the moon and the stars- were not destroyed in the Flood. Thus, God could not be saying, “I will not bring another cataclysmic judgment as great, as “universal” as the Flood, because in the traditional paradigm, that is precisely what He promised to do! In that supposed future judgment, God will destroy every living creature– which He did not do in the Flood. He will destroy the entire cosmos– which He did not do in the Flood! Thus, God’s promise: “I will never again destroy every living creature as I have done” cannot be a promise that He would never again bring a judgment of the same magnitude, because, to reiterate, in the tradition view of the coming Day of the Lord, YHVH will bring about a judgment that is exponentially greater than the Flood! But that would create a contradiction in the Lord’s promise! This great Psalm, which was the inspiration for one of the great church hymns, reflected on both the creation of the world, as well as the Flood. It speaks of How God established the “the heavens of the heavens and the waters above the heavens” and He “established them forever and ever.” This compounded declaration “forever and ever” often communicates the idea of eternality. It certainly speaks of the steadfastness, the abiding nature, of the creation in the Hebraic mind. So, reign of Messiah on the throne of David and the sun, the moon and the stars are equal in their endurance! When we realize that Messiah’s rule and reign on that throne is “without end” (Isaiah 9:6-9; Luke 1:32-33) this is powerful refutation of the idea that the sun, the moon and the stars of heaven will one day be burned up, at the so-called end of time. There are other Old Testament discussions of the enduring nature of the material creation. See the first installment where we cite Ecclesiastes 1:4 for instance. But, this is sufficient and powerful refutation of Frost’s claim that the Old Testament predicted the passing of material creation. It will naturally be rejoined that there are OT prophecies of the passing of “heaven and earth.” And of course, that is true. However, are those prophecies contradictions of the passages we have cited, or, is there something else about those predictions that must be examined? Is it possible that, in spite of Frost’s claim that it is “pernicious” to think so, those predictions of the passing of heaven and earth do in fact speak of the passing of Israel’s covenantal world? Do they perhaps speak of the passing of the Law of Moses, Israel’s covenantal heaven and earth? We will examine some of the OT prophecies of the passing of heaven and earth in our next installment, so stay tuned. 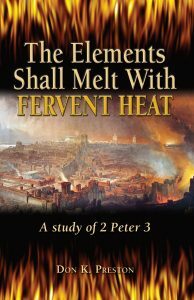 In the meantime, get a copy of my book, The Elements Shall Melt With Fervent Heat. You will be amazed at the wealth of evidence that I adduce to prove that the Bible did not predict the passing of the physical heaven and earth.